2005: strawberry shortcake with strawberry-red wine sorbet and vanilla crème anglaise. Which strawberry shortcake would you prefer? I seem to make strawberry shortcake at least once a year. I guess it is one of those comfort desserts that is both easy to make and well loved. 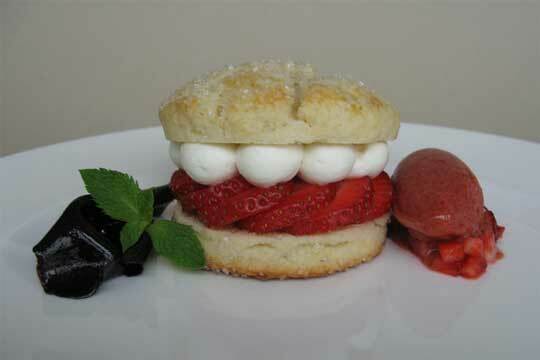 It is especially good when you have a tender biscuit, fresh local strawberries and vanilla whipped cream. This recipe comes from Baking Illustrated, which is by the editors of Cook’s Illustrated magazine. It makes a wonderfully moist and tender biscuit. Start the recipe by preparing the fruit, then set the fruit aside while preparing the biscuits to allow the juices to become syrupy. After cutting 6 perfect rounds of dough, we found that the scraps could be pulled together, kneaded, and cut to get 1 or 2 more rounds. These shortcakes will be a little tougher and less attractive than those from the first cutting. 1) Place 3 cups of the hulled strawberries in a large bowl and crush with a potato masher. Slice the remaining 5 cup berries and stir into the crushed berries along with the sugar. Set the fruit aside to macerate for at least 30 minutes and up to 2 hours. 2) Adjust an oven rack to the lower middle position and heat the oven to 425ºF. in a food processor, pulse the flour, 3 tablespoons of the sugar, the baking powder, and salt to combine. Scatter the butter pieces over and process until the mixture resembles course meal, about fifteen 1 – second pulses. Transfer to a medium bowl. 3) Mix the beaten egg with the half-and-half in a measuring cup. Pour the egg mixture into the bowl with the flour mixture. Combine with a rubber spatula until large clumps form. Turn the mixture onto a floured surface and lightly knead until it comes together. 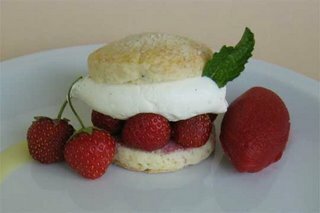 5) Bake until the shortcakes are golden brown, 12 – 14 minutes. Place the baking sheet on the wire rack and cool the cakes until warm, about 10 minutes. 6) When the shortcakes have cooled slightly, split them in half. Place each cake bottom on an individual serving plate. Spoon a portion of the fruit and then a dollop of the whipped cream over each cake bottom. Cap with the cake top and serve immediately. Posted by Sam at 7:41 p.m.
Couldn't I have them both??? Ok ... I'll choose the first one based soley on the addition of creme anglaise! I'll go for the 2006 version... the presentation is nicer...I love it!! This looks so much like a dessert fro "moi"! Please! For you I would make both. I do hope you try the shortcake recipe Kelli Ann. The biscuit is wonderful. I love this recipe; it is so good right out of the oven. It melts the cream a little and makes the whole thing messy, but so, so good. I like the first one for its "homemade" appeal, but I am always a sucker for sorbet, espcially when presented so elegantly! Wow! Great timing- I've just ordered strawberries, etc for this weeks shopping- I thought I would make Strawberry Shortcake! Now, I'm torn between which recipe to try! Argh! both look fabulous, Sam...who could choose?! Thanks to everyone for their wonderful comments. I have been busy with a move across the country and with settling in, new posts should come soon. Cheers! How come i have lived without knowing your blog before? This shortcake looks so delicious. Thanks for visting and your comment Fanny!